Franco Columbu is often known as Arnie’s friend who also happened to be a bodybuilder, but this does Franco a massive disservice. In many ways Franco Columbu was the ideal bodybuilder. Standing at only 5 foot 4 inches, Franco was one of the strongest bodybuilders around, and was a World’s Strongest Man contender. He won 4 Mr Olympia titles (though only two were outright wins), and three IFBB Mr Universe titles (two outrights and one “small”). He also won powerlifting titles (managing a 353.8kg deadlift at only 84kg bodyweight). Was the Amateur boxing champion of Italy, and had a successful film career, before becoming a chiropractor. He’s just one of those people who excels at everything they turn their hand to. 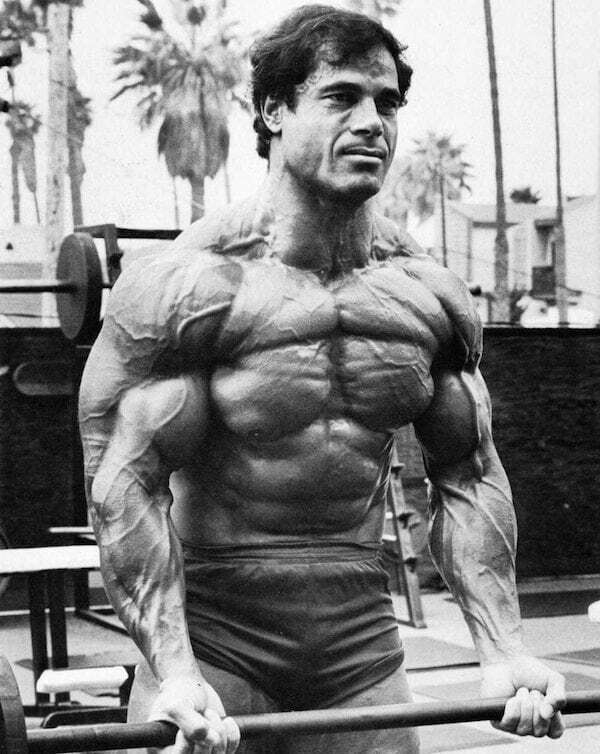 Franco Columbu was born in Sardinia on the 7th August 1941 right in the middle of World War Two. While growing up his goal was to be a boxer, rather than a bodybuilder. He became the amateur boxing champion of Italy, but says that he didn’t enjoy boxing due to the difficulty recovering from a fight. After boxing he concentrated on powerlifting, winning titles in Italy and Germany, as well as winning the European Powerlifting Championship. He entered his first bodybuilding competition in 1966, coming 4th in Mr Europe. In 1968 he won the NABBA Mr Universe (Most Muscular) award, and in 1969 he won the IFBB Mr Europe title. It was in 1969 that he and Arnold were brought over to America by Joe Weider, Arnold was given $80 per week, while Franco was only given $60 . To make extra money Arnold and Franco started their own bricklaying company called “European Brick Works”, they doubled their prices and referred to themselves as speciality Bricklayers. This led to their company becoming very successful and was based on a complete lie! It was in these early years in America where Franco’s bodybuilding career really took off. In an article in FLEX magazine, Franco talks about the culture shock he suffered from when entering the Gold’s gym with Arnold. He came in as the European powerlifting champion, but was shocked at how much stronger some of the other members were than him. He realised that the strongest people didn’t even bother competing in powerlifting. In 1970, Franco won the IFBB Mr World competition in the short category. He also won the overall award in the 1970 IFBB Mr Universe competition. A title he would regain in 1971 (before being controversially disqualified). In 1971 he won the overall award at the IFBB Mr World competition. At this time Columbu was considered one of the strongest people in the world, and would constantly perform strongman fetes such as lifting a car or blowing a hot water bottle up with his lung power. He really was the embodiment of powerlifters becoming excellent bodybuilders. The biggest competition in bodybuilding is Mr Olympia, at the time it was split into two categories: Under 200lb, and over 200lb. Once a winner had been chosen from each category, the two would face off against each other to receive an overall winner. This is why Franco can claim to have won the 1974 and 1975 Mr Olympia but not to have won the overall award (Arnold won on both occasions). In 1976, after Arnold had retired, Franco was able to win his first overall Mr Olympia title. Beating Ken Waller in the overall competition. After winning he retired from bodybuilding, competing in the World’s Strongest Man in 1977, where he came fifth after dislocating his knee during an event. In 1981 he returned to compete in a final Mr Olympia, beating Chris Dickerson, and Tom Platz into second and third respectively. The 1981 competition was without a few major stars (Frank Zane, Mike Mentzer, and Boyer Coe) who were boycotting the competition after Arnold’s controversial 1980 win. Franco had a fairly successful acting career, he made his acting debut in 1977 with “Pumping Iron” (which was filmed during the 1975 Mr Olympia competition). He then had small roles in “The Terminator” and “Conan the Barbarian”. He became a Chiropractor, and has written a book on dieting and training for bodybuilders. When he was training for Mr Olympia, Franco would train up to 4 hours per day (2 hours in the morning and 2 hours at night). He did this for 10 weeks straight! His training program would pair chest and shoulders together, back, legs, and arms were trained separately. He would train 6 days in a row and then have a day’s rest. He would use supersets, and would use a lot of high rep sets, he would train to failure on exercises like dips, and he was always competitive. Describing his desire to win any competition, including chin up competitions in Gold’s Gym. He would deadlift and squat ridiculously heavy weights. Franco has said that having Arnold as his training partner was what pushed him, he admits that if he had not been training with him, then Franco may not have managed to get anywhere near Mr Olympia. It seems like both bodybuilders thrived off competing with each other, and that their friendship was mutually beneficial. What’s great about Franco is his complete indifference to fad diets, he talks about Frank Zane having a different diet every month, and having a pill for everything (to go to sleep, to take with breakfast etc). Franco just ate what he wanted. While every bodybuilder was copying Arnold (who liked to eat Oatmeal for breakfast), Franco would order eggs on toast. For lunch he would eat steak and pasta, as much as he felt he needed to work hard in the gym. As Franco points out, carbohydrates are the bodies preferred source of energy, so ensuring that you are eating enough of them is vital. Franco should be remembered as one of the most successful bodybuilders of all time. He had a truly fantastic physique, and was one of the strongest people in the world at the time. His approach to diet is a breath of fresh air, and his training was legendary. A true servant of the sport.